If you enjoy home garden tours, this is the post for you. We attended the Sandy Springs Society Seventh Annual Garden Tour at the beginning of this month that featured 5 extraordinary private home gardens. All proceeds were to benefit the Sandy Springs Society, a philanthropic organization, so it was a win-win for everyone involved. Homeowners got to show off the results of all of their hard work, patrons were allowed to gawk in amazement while gathering landscaping ideas and local charities benefitted from the event. This was our first Sandy Springs garden tour and it tops our list as one of the best home garden tours we’ve ever attended. I suppose you’d like to have a viewing. I don’t blame you one bit…I’m with you! The cost was a mere $30 for the two of us and we feel it was well worth it, mainly due to one particular fully landscaped, 10 acre property. The other homes were beautifully landscaped, as well, but the property at "Garden Tour stop #1" was simply a knockout…and that, my friends, is the focal point of this post. "Garden Tour stop #1" had a tremendous variety of plants, a multitude of hardscapes, and the scale of it all is extraordinary. This is not a finished garden, like most gardens, but it has taken at least 18 years to get it to this point. We took advantage of a couple of strategically located benches and swings to take it all in. The Japanese Koi ponds and lake are filled by 3 wells on the property. The lake also provides irrigation to the entire property. There is a barely noticeable, rustic looking pump house that keeps the water flowing. I’ve got a photo of the pumphouse below amongst the large image group. 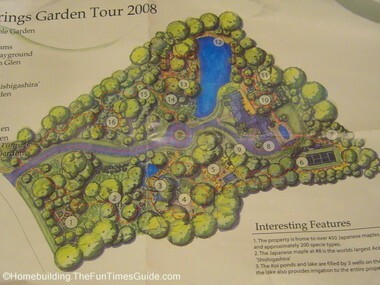 The photo below was a handout being given to all garden tourists that entered the property. What a great idea to provide a map that shows the path through the property and points out features you wouldn’t want to miss! I’d like to share some of my photos that I took along the mile, or so, of pathways that meander through the property. You can find more photos of some of the features noted above by clicking on the appropriate hyperlink after I’ve posted the article on that subject.